We know you love your first tiny one-preamp audio interface as much as you do your girlfriend, but you have to admit that it probably has become a bit limited, especially since you started playing with other musicians... Are you looking for a two-preamp interface with advanced and attractive features? Have you fallen in love with a model recently? Apogee just released the newly redesigned Ensemble audio interface for Mac, a 30x34 unit featuring Thunderbolt 2 connectivity. We visited Apogee HQ in Los Angeles on the day it was released to video the new interface. Did you ever dream of a totally mobile studio, a compact setup that can fit in a backpack? A rig that you can carry with you virtually anywhere, and record and produce music, even where there's no AC power? Now, thanks to the audio capabilities of the Apple iPad, that dream is both achievable and affordable. Part 1 looked at how to interpret the specs you see in ads and listings for audio interfaces. This time around, we offer info to help you figure out the audio interface that best fits your needs, presented in FAQ style. 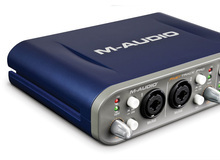 Shopping for an audio interface can be daunting, due to the countless models on the market and the variations in inputs, outputs, formats, maximum sampling rates, and numerous other specifications. The aim of this 2-part article is to demystify the subject to make it easier for you to figure out which interface best suits your needs. Computers can be pretty smart, but when it comes to sound, they need a translator that can convert sound waves into the digital language of ones and zeroes. Audio interfaces provide this translation.